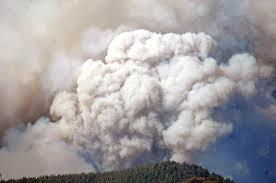 The U.S. Forest Service and the Interior Department recently advised Congress that they expect a combined $470-million shortfall in their $1.4 billion wildfire budgets this year as a direct result of the changing — and elongating — nature of fire season. Over the last 30 years, federal officials said, the fire season has extended by more than two months, and the amount of acreage burned each year has about doubled. With continued encroachment of housing developments into wild lands, more property and people are at risk, especially with prolonged droughts such as the one parching California. And it’s not just this year. If the projections pan out, this would be the seventh out of the last 12 budgets in which federal officials have had to scramble to cover unanticipated higher costs of fighting wildfires. Yes, that suggests they need to put more money in that budget, but the problem is that means cutting from somewhere else. As it is, to meet the shortfalls agency officials borrow from budget lines meant to support reforestation, thinning and controlled burns aimed at mitigating wildfires, and cutting forestry personnel to add firefighters. So fighting these fires affects more than just the burn zones. And it’s serious business. Last year, wildfires killed 34 firefighters, burned 4.1 million acres and destroyed more than 1,000 buildings, federal officials said. Since 2000, the federal cost of fighting wildfires has exceeded $1 billion in all but three years. A massive forest fire is a natural disaster in the same way a hurricane or tornado is. But while the government seems to understand that you can’t budget for a hurricane, paying for the disaster out of a special emergency account funded specifically for that purpose, it still treats the cost of dealing with catastrophic fires as it does any other expenditure. An annual amount is budgeted to fight them, with little more than an estimate of what the fire season will actually bring. This archaic method of funding fire suppression is wreaking havoc with Forest Service budgets, and it is also making it likely we’ll see more and costlier fires. In recent years, we’ve seen the United States Forest Service have to transform itself into the “United States Fire Service.” Today, fire suppression accounts for more than half of the agency’s budget. And even then, Congress isn’t appropriating enough money to cover the true cost of battling fires, forcing the Forest Service to borrow from other, non-fire accounts. “I think the best part is when you get off a shift and you’re cruising through the town and there are little old ladies or little old men going ‘Thank you, firefighters,’” said inmate firefighter Culvin May, 39, from the Delta Conservation Camp in Suisun City. There are 196 inmate fire crews that perform more than 3 million hours of emergency response work annually, making the program an essential tool in the state’s firefighting system, according to Cal Fire spokesman Daniel Berlant. Inmate firefighters make up about one-third of the Cal Fire crews responding to wildfires throughout the state. This year has been particularly taxing on firefighters with the uptick in the number of fires as a result of the drought. 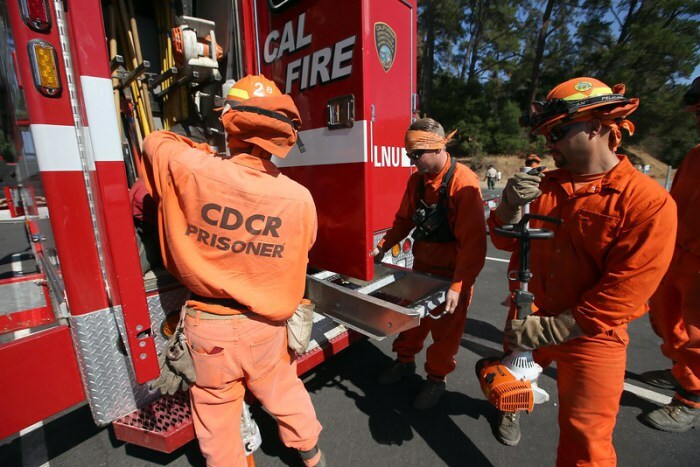 May is among 3,800 low-level offenders, including 225 women, who volunteer and train to work on the front lines of wildfires or in conservation camps year-round, said Bill Sessa, spokesman for California Department of Corrections and Rehabilitation. There are 43 volunteer firefighter camps throughout the state, which saves $80 million to $100 million per year through the Conservation Camp Program. To join a fire camp, inmates must apply to volunteer, endure the same four-week training as Cal Fire workers and have the right temperament. “The firefighter inmates have to meet all the same mental and physical standards as civilian firefighters because when they’re on the fire line, the fire doesn’t discriminate,” Sessa said. On average, inmate firefighters earn $2 a day in camp, plus $1 an hour when fighting fires. They receive two days off their sentence for every day they volunteer. CAL FIRE is currently authorized to operate 39 Conservation Camps statewide that house nearly 4,300 inmates and wards. These camps are operated in conjunction with the California Department of Corrections and Rehabilitation (CDCR). Through these cooperative efforts CAL FIRE is authorized to operate 196 fire crews year-round. These crews are available to respond to all types of emergencies including wildfires, floods, search and rescue, and earthquakes. When not responding to emergencies, the crews are busy with conservation and community service work projects for state, federal, and local government agencies. Fire crews perform several million hours of emergency response each year, and more on work projects.